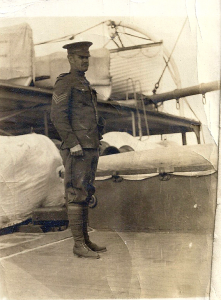 Before he was a prisoner of war in Germany (a story explored in an earlier article), Sergeant William A. Alldritt served as a machine gunner with the 8th Battalion of the Canadian Expeditionary Force (CEF). 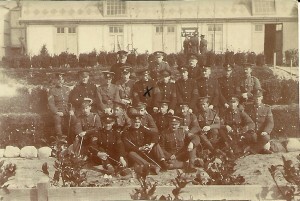 However, as documented in many of the letters he sent home and in letters written by his colleagues and fellow soldiers, he also used his experience as a pre-war YMCA Physical Director to contribute to the formation and training of his fellow soldiers at training camps in Valcartier and Salisbury Plain. Since it was introduced to Canada in 1851, the goal of the Young Men’s Christian Association (YMCA) was to provide boys and young men with healthy activities and sport, intended to improve their spiritual and moral condition. 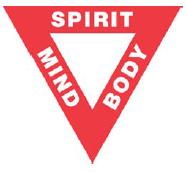 This philosophy was represented by the three sides of its triangle logo, signifying spirit, mind and body. Notice of Alldritt’s ascent on the South Albert Peak. While in Revelstoke, Alldritt joined the Alpine Club of Canada, an amateur athletic association focused on mountaineering. On September 7, 1909, he completed one of the first ascents of South Albert Peak, as documented by club President, Arthur O. Wheeler,[ii] one of the highest peaks in British Columbia. In 1910 Alldritt returned to his family home in Winnipeg, Manitoba, while continuing to work for the YMCA as an Assistant Physical Director. His duties included providing physical education instruction in Winnipeg YMCAs and managing the YMCA’s summer camp, Camp Stephens on the Lake of the Woods, near Kenora, Ontario. In 1912 he assumed the role of Physical Director at Winnipeg’s Selkirk Avenue YMCA. 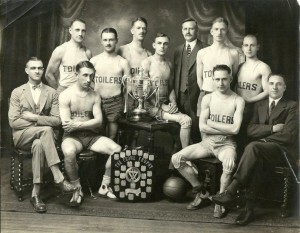 Alldritt (standing in the suit) with the 1926 Winnipeg Toilers basketball club. In 1983, Alldritt was posthumously inducted into the Manitoba Basketball Hall of Fame in the “Builders” category for his work to establish the Toilers team in Winnipeg, which he began in 1910. Under Alldritt’s guidance, the Toilers became the Canadian national champions in 1926, 1927 and 1932. Alldritt enlisted as a regular soldier with the 8th Battalion, CEF (the 8th Battalion had amalgamated the 90th Winnipeg Rifles, which was the unit he was attached to prior to serving with the South African Constabulary during the Second Boer War). While in Valcartier, Alldritt’s prior service with the YMCA did not go unnoticed. In a letter to Agnes written on September 27th, he noted: “Of course I told you that I had been promoted to Sarjeant Physical Instructor of the Battalion, I therefore have a fairly good standing…” His official Service Record notes that he received a promotion while at Valcartier. Alldritt aboard the Franconia, October 1914. On October 3, 1914, Alldritt set sail for Plymouth, England, aboard the RMS Franconia, part of a convoy of 32 ships contracted to transport the more than 30,000 Canadians, their horses, and equipment. In a letter written to Ethel while aboard the Franconia, he noted that his role as Physical Instructor continued to keep him busy. “I am busy as a tailor, from dawn till dark working away at giving the men enough exercise.” In England, the Canadians were sent to Salisbury Plain to receive training prior to seeing combat. The late Major General S.P. [sic] Lipsett, DSO, had a “mob” (I use the word advisedly) of us raw militiamen to whip into shape for service in France. We knew little of military discipline, and cared less. Later, when under fire, we came to appreciate its value. I don’t know whether he sent for Aldritt [sic] through Col. O’Grady or whether Aldritt dropped as manna from heaven into his lap. 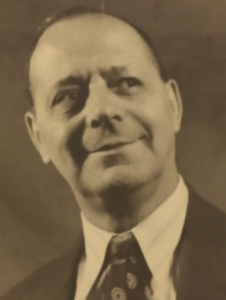 C.V. Combe, as editor of the Winnipeg Tribune after the war (image provided by Soleil Shepherd). In February, 1915, the 8th Battalion was transported to the front and Alldritt distinguished himself as a machine gunner by covering the retreat of his company during the collapse of the Ypres Salient on April 25, 1915, where he was eventually overpowered and taken prisoner. As a POW in Germany, Alldritt made at least four briefly successful escapes, always to be recaptured. In March, 1918, he was transferred to a camp in Scheveningen, near The Hague, Holland, as part of a prisoner exchange, although he technically remained a POW and was not permitted to return home until finally discharged in January, 1919. 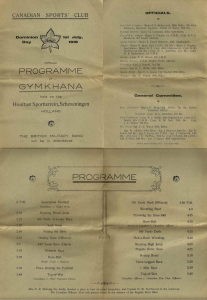 “Official Programme of Gymkhana,” 1 July 1918. Click here for a larger image. In a photograph from Holland in 1918, Alldritt appears as a central figure amongst the prisoners posed in front of a YMCA building, apparently taking pleasure in resuming his old role of organizing recreational activities. Canadian POWs in Holland. Alldritt is marked with an “X”. A September 1919 pamphlet from the Victoria, B.C. YMCA. Click here for a larger image. By 1921 Alldritt had returned to Winnipeg where he continued to serve the goals of the YMCA and to influence development of amateur sport in roles which included Director of the Amateur Athletic Union of Canada, President of the Manitoba Track and Field Association and President of the Canadian Amateur Basketball Association, until his untimely death at the age of 51, in February, 1933. [i] Murray G. Ross, The Y.M.C.A. in Canada: The Chronicle of a Century, (Toronto: Ryerson Press, 1951), p. 235. [ii] Arthur O. Wheeler, The Selkirk Mountains: A Guide for Mountain Climbers and Pilgrims, (Winnipeg: Stovel Company, 1912), p 38. [iii] James Naismith, Basketball: Its Origin and Development, (Lincoln NE: University of Nebraska Press, 1941), p.25. [iv] W.A. Alldritt card to E.G. 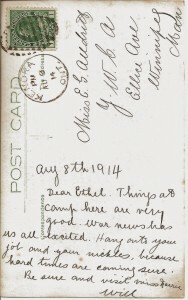 Alldritt, from Camp Stephens, August 8, 1914. Unless otherwise noted, correspondence is from the unpublished letters of W.A. Alldritt. [v] Further described in Ross, p.273, and in Charles W. Bishop, The Canadian Y.M.C.A. in the Great War. (Toronto: National Council of YMCAs of Canada, 1924), p.18. [vi] W.E. Davison letter to C.A. Sayer, Secretary Treasurer, YMCA, Winnipeg, January 19, 1933. By this time Alldritt’s health had greatly deteriorated and Davison wrote to Alldritt’s employer in an effort to assist Alldritt to make an ultimately unsuccessful reparations claim. [viii] C.V. Combe letter to Major G.W. Northwood, July 14, 1938. Letter written in support of Agnes Alldritt’s application for widow’s benefits, which she was granted. [x] By 1919, T.D. Patton had been made supervisor of the YMCA camps in Manitoba and Saskatchewan while H.R. Hadcock held a similar role in Alberta and B.C. (Bishop, p. 75). [xi] Victoria YMCA, “Four Veterans…” Pamphlet from W.A. Alldritt’s personal papers.